A few weeks ago, I asked for your input on a Thanksgiving recipe that you would like to see ‘Waffle-ized’. Well, you commented, and I cooked! 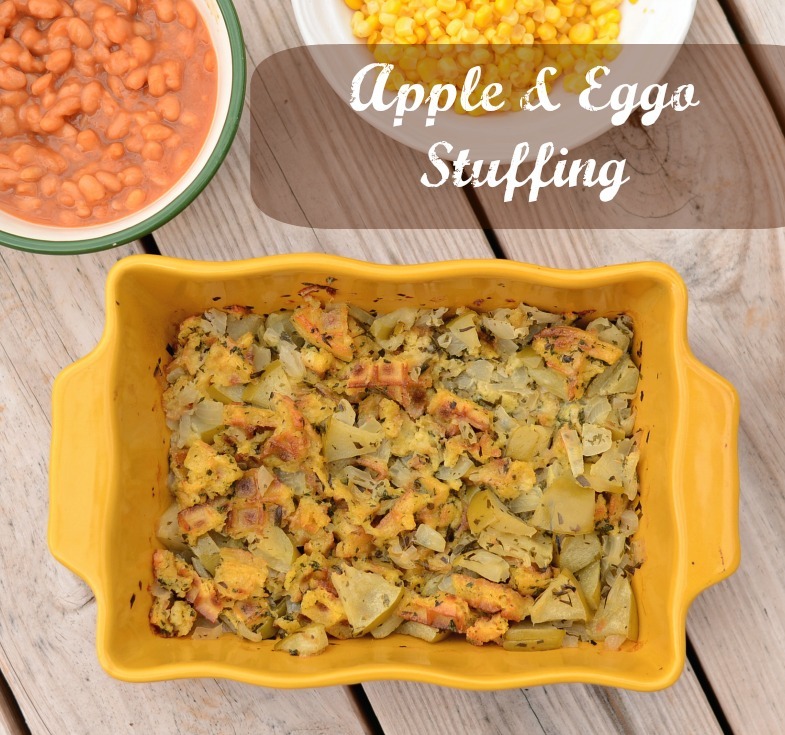 This week, I took crispy Eggo Waffles and turned them into Apple and Eggo Thanksgiving Stuffing. 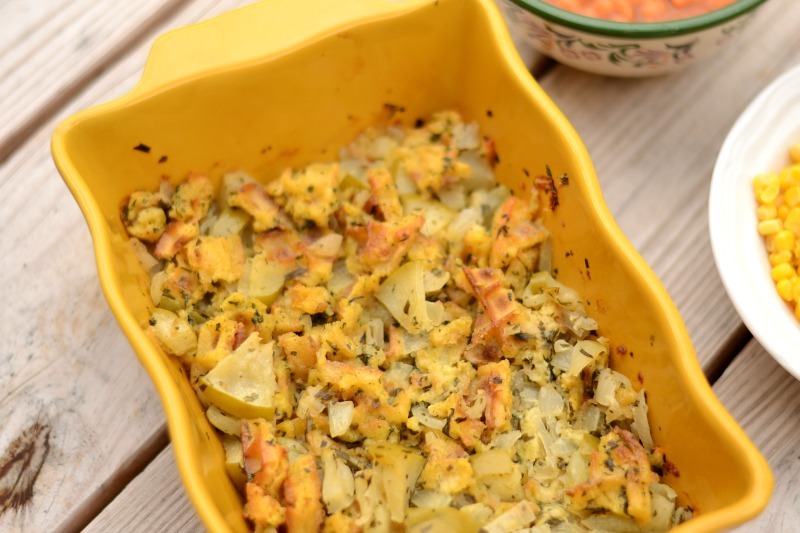 Many stuffing recipes call for huge quantities, but this recipe feeds about 4-6 people. We are planning a more personal Thanksgiving this year, so I have been trying out recipes for a smaller crowd. Melt margarine in hot pan while dicing onion. Once margarine is melted, add onion, apple, thyme, and terragon and cook for about 5 minutes. Season with salt and pepper and combine. Add 1 cup of chicken broth and bring to a boil, then reducing heat. In a separate bowl, beat one egg with a wire whisk. Add Eggo pieces and stir until they are coated. Spray a small baking dish with cooking spray. Pour in Eggo mixture, followed by broth mixture. Stir all together and bake covered for 20 minutes. I’m sharing this recipe as a proud Chief Waffle Officer! Do you have a creative spin on an Eggo recipe? Eggo is currently taking entrants for their Great Waffle Off! Entrants have a chance to win big with a $5,000 grand prize! Two entrants will win $2,500, and eight entrants will win a year’s worth of Eggo products. Enter on their Facebook page, check out the info on their website, or get more inspiration on their Pinterest board. 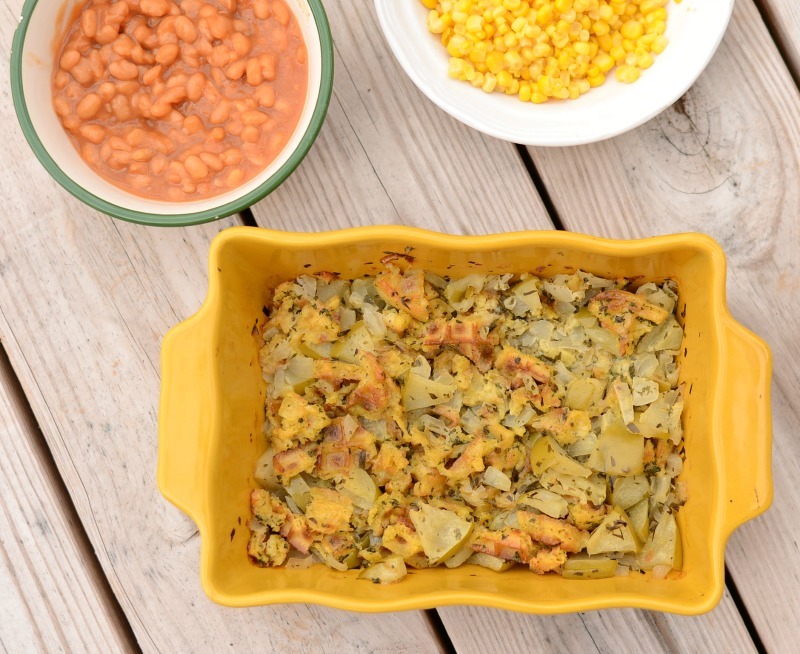 This recipe is inspired by the great stuffing recipes over at The Food Network. Melanie you are a genius! I would never had thought of using waffles as a stuffing ingredient! I am pinning this to try the next time we have poultry! Ooh wow, that looks really delicious! I never would have thought to do that, but I bet it’s yummy! Ohhhhh this one looks SUPER YUM! I LOVE all your Eggo ideas!! Never would have thought of this one!! You are so clever! This is one of the most creative things ever! I’m intrigued and kind of want to try it now! Melanie you are so creative! I never would have thought to make stuffing with waffles!